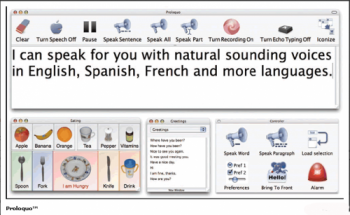 Proloquo is a multilingual Augmentative and Alternative Communication (AAC) solution for Mac for people who have difficulty speaking or cannot speak at all. The software also offers features for users with limited vision or learning disabilities. Our legacy products are no longer actively developed. This means that we cannot guarantee they will continue to work on future versions of OS X. We urge you to download and test the demo before purchasing the product to see if it works as you would expect on your computer. We are still offering these products as a courtesy to those users who find it meets their needs, but will eventually discontinue sales. 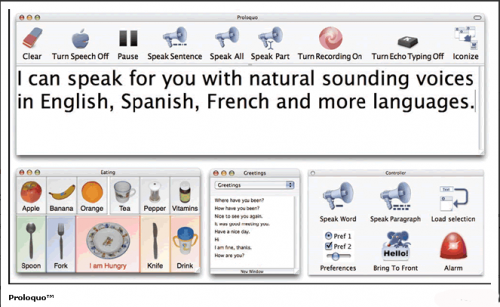 Proloquo is a multilingual Augmentative and Alternative Communication (AAC) solution for Mac for people who have difficulty speaking or cannot speak at all. The software also offers features for users with limited vision or learning disabilities such as speech feedback in any application while typing and the ability to speak what is below the cursor. Note that Proloquo is for Mac OS X and is different from Proloquo2Go, which is for iPhone, iPad and iPod touch. Proloquo also provides a talking word processor and an advanced speech engine for our KeyStrokes on-screen keyboard and our SwitchXS switch access solution. Proloquo includes layout editor LayoutKitchen, with which users can design their own speech panels with colorable and resizable buttons containing text and/or images in a variety of formats. Proloquo also comes bundled with 5 Infovox iVox voice credits. With these credits you can purchase Infovox iVox voices you like in any language. If you want to use additional voices, you can purchase extra voice credits. Infovox iVox offers the best naturally-sounding voices for Mac in a wide range of languages. Full Alternative and Augmentative Communication solution for Mac OS X. Speaks text (also while you type) in any application. Create sets of custom words and phrases that are spoken with a simple mouse click or keystroke. Create textual speech panels for commonly used words and phrases. Optional: Use with custom image-based speech panels created with LayoutKitchen using over 8000 resizable, industry-standard Picture Communication Symbols from Mayer-Johnson (purchase separatly). Automatically synchronizes typed text and speech functions in applications such as TextEdit and Nisus Writer Express as the user moves from window to window effectively turning these applications into talking word processors. Provides control over speech rate, pitch and exceptions. Provides very large icons and resizable toolbars. Converts text to audio files and to iTunes tracks ready for your iPad, iPhone or iPod touch. Includes 5 Infovox iVox voice credits that you can use to download naturally-souding voices selected from 31 languages. Download the free time-limited full trial version to evaluate the software below. roloquo comes bundled with naturally-sounding Infovox iVox voices. The Infovox iVox voices are available à la carte, which enables you to purchase only the voices you like and, if you prefer, in different languages. If you want to have multiple languages, you can use the voice credits to license any voice from any language. IMPORTANT NOTE: Proloquo is for Mac OS X and is different from Proloquo2Go, which is for iPhone, iPad and iPod touch.